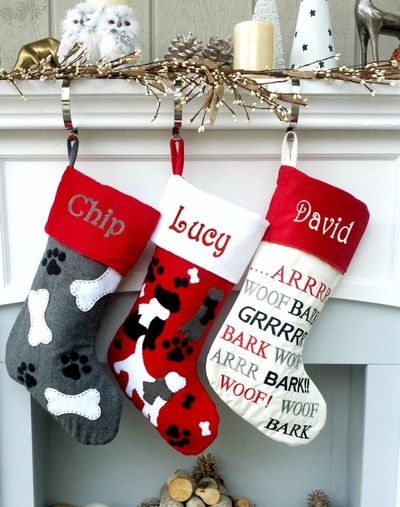 This stocking is perfect for every dog lover out there. These stockings feature an adorable dog and paw appliques and Wooof word art. Grey Stocking Sold out on 11-6-2016 for the season. Red Stocking Sold our on 12-16-2016 for the season. There is a choice of 3 designs, so if you have multiple dogs you can get one of each, a different design for each of the pups. Measurements: The stockings are about 19" measured diagonally from the stocking hanger to the toe and about 8" wide at the top of the cuff. Material: High end Felt and Polyester lining. Accented with hand stitched appliques.